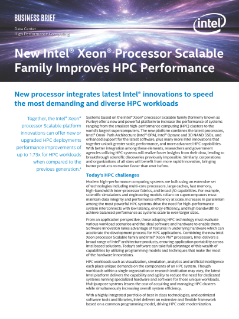 New Intel® Xeon® processor Scalable family based platform offers improved performance plus Intel® Omni-Path Architecture, Intel® Optane™ memory and other Intel innovations. Learn about Intel's portfolio of high performance computing (HPC) processors, architectures, frameworks, and solutions. Intel VP Dan McKeon discusses Intel's multi-cloud strategy and we are focusing our business on modernizing the workforce.